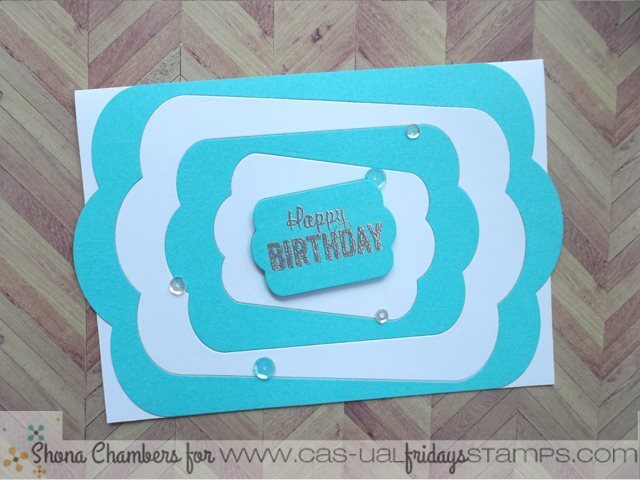 CAS-ual Fridays Stamps: Birthday SALE is ending soon! Birthday SALE is ending soon! We have an awesome set of dies called Bubble Box Fri-Dies that just so happens to be on SALE right now! Check out the cool way Shona used them to create a funky and fun birthday card! Now you could cut several boxes out and layer them together to get a fun pattern but it might get a little bit weighty unless you're using really thin cardstock or paper. So what Shona did was to make cuts in each box panel so that she could inlay them. Keeps it flat, keeps it light and looks super cool! A few well placed sequins adds a little sparkle and if you wanted to dress it up even more, you could stamp alternate layers with one of our background or border stamps! Our big Birthday SALE is ending soon on October 31! Be sure to grab the sets you need in your stash at their special prices before they go back to full price! Oh my !! I love that card so much !